No, not those kind of voices. I’m talking about listening to the ones my parents recorded when they were young and newly married seventy years ago. You, too, can hear them below. On a recent visit home, my mother brought out a shoebox filled with cassette tapes. Many were recordings of the numerous community shows she, my father, and brother performed in for their church. Other tapes contained the songs they were learning. But the one that interested me the most was a recording of New Year’s Eve dated 1948. My grandparents owned an interesting machine that created LP records. My father’s large family made numerous records when they got together. Many years later, Mom used a tape recorder to capture the sounds on one record. The sound isn’t perfect but it is obvious she and my father were having a good time with friends. They sang and told jokes. Of course, my father was the biggest ham of all. You can hear his signature Woody Woodpecker laugh. I had to get some of it down, so I used my iPhone to record snippets. I’ve included them here. I love the duet by my parents. My father is a scream with his comic speech. My father, who died in 2016, loved to perform. Of course, his first obligation was to his family, so instead he worked most of his life doing bodywork on cars. But I recall him playing his guitar and singing for us kids. He liked to tell jokes, clean ones, of course. I certainly enjoyed going back in time with Mom. And now I have a few recordings of it to share. ABOUT THE PHOTO ABOVE: My parents with family on their wedding day. Mom’s maid of honor was a co-worker. Our family friend, Ernie Nugent, died Jan. 11 at age 73. He was one of the good guys. Our son, Nate, knew him best. Ernie hayed the farm across the road in the Ringville section where we lived first in that town. He also raised pigs there. They were good buddies. Through Ernie, Nate got to know the part of country living that was close to the earth — and all about machinery. I know long before he was a teenager, Nate was Ernie’s extra hand, driving a tractor or farm truck. I recall looking out the kitchen window when I was washing dishes to see Ernie take down a hog with one shot, and then Nate helping him get it ready for butchering. Nate and Ernie had a special bond. He often joined Ernie when he plowed the roads, riding for hours in the cab of the truck. Ernie would stop the truck at the end of our driveway for Nate to join him. I knew Ernie from when I was a reporter, covering the hilltowns. I’d call the highway departments for an update whenever we had a bad winter storm, or in the midst of mud season or a road project. Ernie wasn’t a talkative guy. I recall covering one Worthington Town Meeting, where residents were voting on the budget and other items. On the agenda was the purchase of a new dump truck for the highway department. A smart-alecky newcomer got up and wanted a justification for the purchase. So the moderator asked Ernie whether the town needed to buy a new highway truck. Ernie stood, said “yup” and sat down. And, after a good laugh, the voters passed it. I moved away from Worthington going on ten years ago. But Deen, Ernie’s wife, kept us informed at Christmas with long letters about the family, their winters in Florida — and Ernie’s health problems. I’m sure they were tough on a man who liked to be so active. Here’s to Ernie Nugent who lived and worked well. He was the salt of the earth. 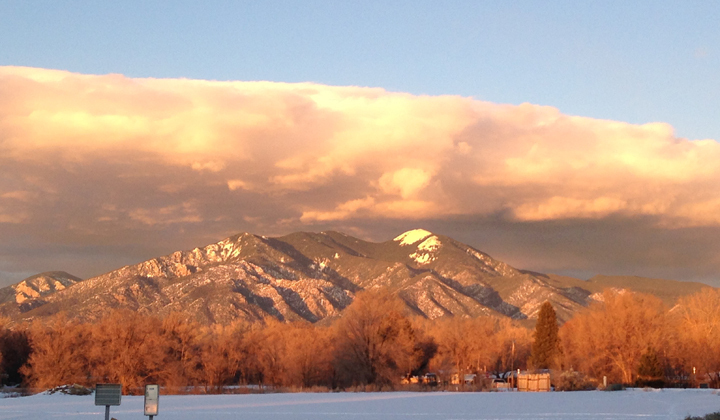 ABOUT THE PHOTO ABOVE: It was a lucky moment when I caught this photo of the light playing on the Sangre de Cristo Mountains. I was leaving the newsroom when I got out my phone to take the shot. 2015 was a very good year. It was a creative year — and that is important to me. During 2015 I kept writing and rewriting. New projects include the Los Primos bilingual series for young readers written with my collaborator Teresa Dovalpage, the fourth in the Twin Jinn series and a YA novel. I spent time with the novels I finished a while ago — I suppose they’re not done until they are published — to make them better with what I know now. I found new authors to love. And I got to do more public interviews with authors, including Anne Hillerman and the fellows for the Aldo Leopold Foundation. Other blessings: Hank’s companionship, a meaningful job, caring friends, and good health. A productive garden — we just finished the last of the carrots, kale and chard stored in the fridge. We still have beets. So what’s ahead? I will keep writing and rewriting. I aim to move more and sit less. I will visit family and friends. I will grow our food and flowers. And, I will embrace the change 2016 will bring me. 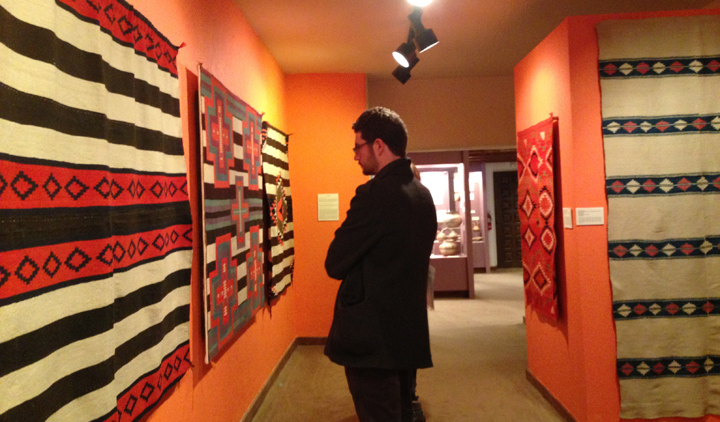 ABOUT THE PHOTO ABOVE: That’s our son, Zack, at the Millicent Rogers Museum in Taos, one of three we visited with his friend Suzie during their Christmas visit. My Dad left this life Sept. 5. He would have been 93 in November. My Dad was not only special to his family but to my hometown of Fairhaven, Massachusetts. At his viewing I heard story after story about my Dad. People had worked at the Ford dealership where he was an auto body repairman or coached local sports teams with him. Many played for my Dad and each shared the nickname he gave them. There were people who went to his church or carried the statue of Our Lady of Angels in the feast’s procession alongside him. The list is long. He will be missed by many. Here is the eulogy I wrote and delivered at his funeral. Our Dad, Antone “Hawk” Medeiros, grew up poor but he lived an incredibly rich life. He built us a house by hand on Jesse Street and made it a home with our mother, Algerina. He worked hard for his family as an auto body repairman at Ashley Ford. Our Dad was a good dad. He was a loving dad. He was a funny dad. 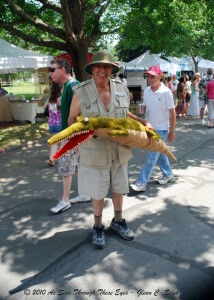 My Dad in one of his many costumes as captured by my cousin Glenn C. Silva. He would do most anything for a good laugh whether it was a belly flop in the pool or wearing one of his crazy hats. He was always ready with a joke, usually a corny one, but we laughed anyway. As our brother will tell you next, our Dad loved sports. Let me rephrase that, he loved local sports and had nothing good to say about over-paid professionals. As kids, we spent hours at a park while he played softball. And if we were really good, which was usually the case, we got to go out for ice cream afterwards. Our father liked to show off how much we kids trusted him. He would have one of us hold the football in place with a finger while he booted the ball. We never flinched. He was a great dancer, and we were lucky when we got to dance the polka with him. He was a tough guy who never let on when he was sick or hurt. Likewise he didn’t like crybabies. He was proud to be Portuguese. Our Dad was a good grandfather. He was a loving grandfather. He was a funny grandfather. (And he was a great-grandfather.) My sons recall he would step on their toes and give them a friendly punch to the gut just to see how tough they were. He had nicknames for all of them. Well, he had nicknames for practically everyone. Our Dad was a man of great faith. He read his prayer books and attended Mass daily. He would say the three women most important in his life were his wife Algerina, his mother Maria and the Blessed Virgin Mary. My sisters and I were not offended. But our Dad was more than a member of our family. He was a man of the community. Perhaps he coached your team or he coached your kids’ or grandkids’ teams. He could have inspired you be a coach or to be a better person. Maybe you chuckled or had a belly laugh when you saw our Dad do a skit, most often with our brother Tony, at the St. Mary’s Variety Show or when he showed up at a town celebration dressed as Uncle Sam, George Washington, Elvis, or a big brown bear. Of course, our mother created those costumes for him. The upstairs bedroom is filled with them. Perhaps he led the Grand March at your wedding. He could have passed you the collection plate at St. Mary’s Church or prayed beside you. Perhaps you were at the recreation center the town named in his honor. Or you played on the fields he lined at Livesey or Cushman park. Maybe he beat you at horseshoes. I could go on and on about our Dad. He was a man of integrity. He was honest and hardworking, and he passed those traits onto us. Antone “Hawk” Medeiros had a wonderful life, and thank you all for being a part of it. 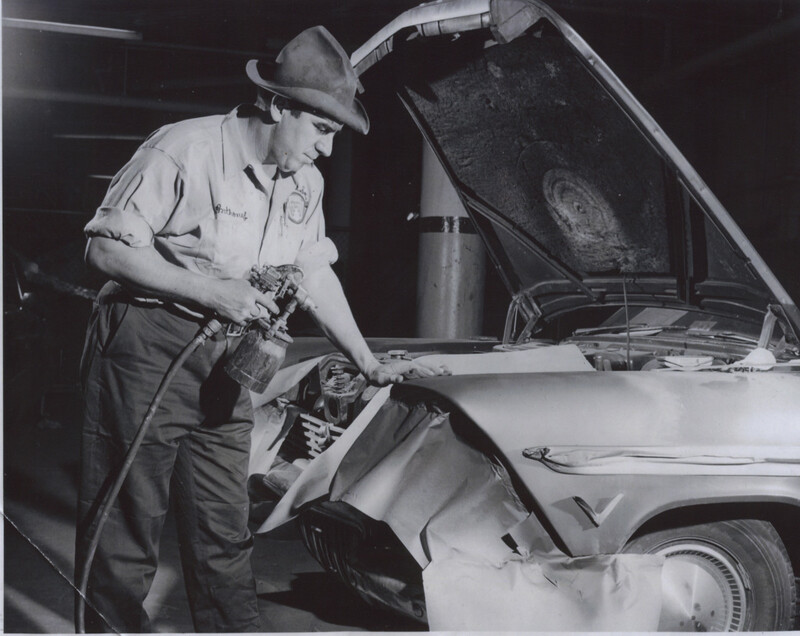 About the photo: That’s my Dad working at the auto body shop. The photo is undated but I am guessing it was 1960 or 1961. A contact I met on Twitter made a request: If I liked his author page on Facebook, he would like mine. I took it as a nice gesture. Ah, but first I needed to create one. What will I do with my author page? It will strictly be about writing — mine, yours and theirs. I hope to post something every day. My Facebook profile is for those who call me family or friend. The digital world has been a wonderful way to reacquaint with people I haven’t seen in years. I enjoy school friends I last saw when I was handed my high school diploma decades ago. I marvel at the lives they have created since. I have Facebook friends who used to be work colleagues and a few from college. Of course, I have lots of family on Facebook, including my husband’s cousins. I can recall times when it was the fastest way to reach one of our kids. I have followed closely from afar as they shared sad news — sickness, death, divorce — and happy news — births, marriages and personal accomplishment. They love animals. They have a wicked sense of humor. Some are religious. Then, there are those who comment on what’s happening politically. I would say most are leftist-thinking liberals. But I respect, as well, those on the other spectrum. As for my own personal views on politics, as the editor of newspaper I keep them off the Internet. My hope is my friends, family and others will join me on my author page. That’s simple. Just go there and “like” me. MORE: I did back-to-back interviews with authors at their readings Friday and Saturday. First, it was Steve Tapia, who wrote De la Tierra The Natural World of Northern New Mexico. Steve is a retired wildlife biologist who writes a column for The Taos News. Steve read from the book, and then I asked questions. He even did the call of a female Mexican spotted owl for the audience. Saturday’s event was with Hannah Nordhaus, author of American Ghost. Hannah’s non-fiction book is about a ghost hunt of sorts for her great-great-grandmother Julia Staab, whose apparition has been sighted at La Posada, a Santa Fe hotel, which used to be her home long ago. We had an enjoyable discussion about the book and what it is like to be descended from a famous ghost. The event, however, was bittersweet. It was the last for Moby Dickens Bookshop, which is closing July 3 after 31 years. The book-selling business has changed. Taos once had 11 bookstores. Now, with the closing of Moby Dickens, it will only have two second-hand bookstores. 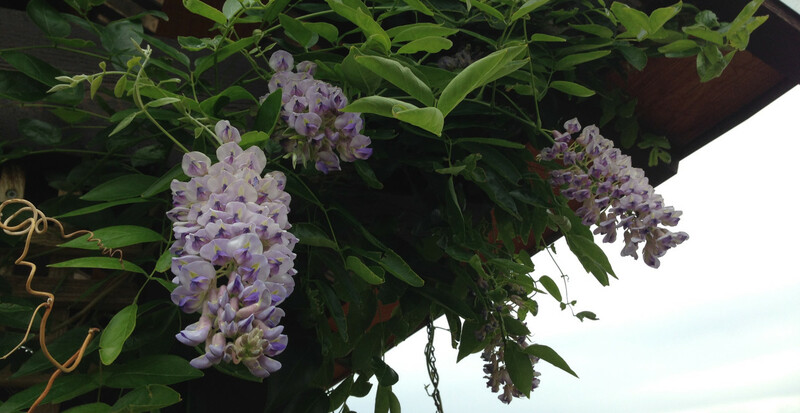 AT LAST: The photo above is my wisteria bush in bloom. I planted it four years ago. Each spring I wonder if it will make it, and this year I was surprised to discover it would flower in this harsh high desert climate. How wonderful.